As an environmentally conscious company, PolyTurf strives to provide our customers with turf products that are as environmentally friendly as possible. We are constantly innovating to improve our turf systems and to ensure they are 100% recyclable at the end of their life. One of PolyTurf’s environmental innovations is our EnviroFlow rapid draining backing, a product ten years in the making that has undergone rigorous testing before release to the market. EnviroFlow rapid draining backing consists of a polypropylene nonwoven geotextile which doubles as a weed barrier. EnviroFlow backing utilizes recycled content, makes the turf 100% recyclable, and provides rapid, even drainage. PolyTurf’s EnviroFlow backing makes our turf system 100% recyclable at the end of its life which prevents it from going to a landfill. Additionally, EnviroFlow contains recycled content and is made with postindustrial recycled polypropylene fibers. Waste from the manufacturing process is recycled and re-used as well. The manufacturing process for EnviroFlow uses very little energy and water, helping conserve valuable resources and helping increase U.S. energy security and independence. Standard urethane synthetic turf backing is stiff and can get much stiffer in cold temperatures. This can lead to wrinkles in the turf and prevent the turf from lying flat and conforming to the base. EnviroFlow backing is lightweight and flexible, allowing PolyTurf to contour to the landscape and prevent wrinkles. Without sacrificing quality, EnviroFlow is approximately 10 oz lighter per square yard than comparable urethane backing products. This makes the turf easier for installers to handle and reduces freight costs. EnviroFlow absorbs almost no moisture compared with standard synthetic turf backings such as urethane and latex, which can absorb as much as 5-6% of their mass. The absorption and release of water can lead to expansion and contraction as temperature and conditions change. The EnviroFlow backing system eliminates this and makes for a more stable turf system with less expansion and contraction and less stress on seams. 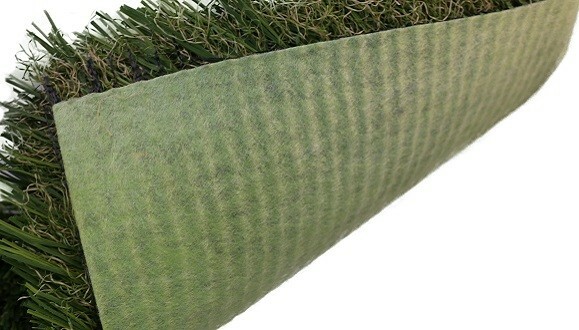 The EnviroFlow backing drains evenly throughout and does not utilize the hole punch system that is employed by standard synthetic turf backing. EnviroFlow backing is more than twice as permeable as standard urethane backing systems and is less likely to clog than a hole punched product. Contact us today for more information and samples of our EnviroFlow backed synthetic turf products.